Irish Grid Reference: J 10443 34964. In an isolated and lonely spot beside Donaghmore Road, just east of the A1 (Dublin to Belfast Road), is the Early Christian Ecclesiastical site of Donaghmore (Domnach Mor) Moy Cova, and a churchyard beside the 19th century St Patrick’s Church, which belongs to the Church of Ireland. 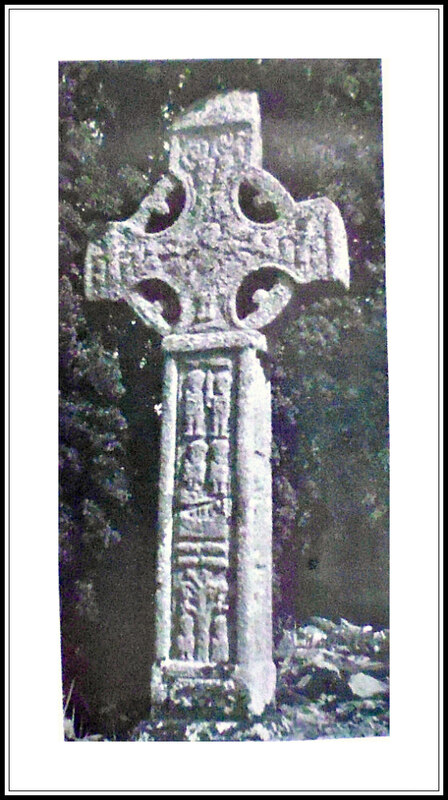 But here also stands the highly sculptured 10th century Donaghmore High Cross with its distinctive ringed cross-head. The place-name Donaghmore means ‘The Great Church’. Here in the 5th century AD St Patrick is thought to have established a church. This quite isolated little churchyard is located some 5 miles north of Newry and 6 miles south of Banbridge in Co. Down, Northern Ireland. To reach the site head north out of Newry for 5 miles on several country roads: Downshire, Belfast, Corcreechy and Aughnacavan, but keeping to the east of the A1 (Belfast road). On reaching a junction of four roads go right onto Donaghmore Road – where on your right you will soon see St Patrick’s Church and the Donaghmore Cross. The Donaghmore High Cross or St Mac Erc’s Cross is a highly sculptured granite ring-head cross which is 10 feet high and is thought to date from the 9th or 10th century AD. It has a thick sturdy shaft and stands on a base of two steps. The ring-head probably came from another similar cross. It was re-erected at the S. side of St Patrick’s Church in 1891, but probably not in its original position. Depicted on the cross are several Biblical characters and scenes, and also panels with figures and decorative interlacing. Biblical characters and scenes on (W. Face) are: Noah’s Ark, Adam & Eve and Moses & David. The cross-head (W. Face) shows Christ’s crucifixion. He has long outstretched arms. At each side of Christ there are figures maybe of Stephaton and Longinus, two thieves and soldiers. An angel around Christ’s head. The (N. Face) depicts David & Goliath and interlacing. An angel on the cross-head. The (E. Face) has David or The Judgment of Solomon (David plays his lyre for Saul). Also figures, Moses smites water from the rock, David with the head of Goliath, David slaying the lion, The Last Judgment and St Paul with a bird or beast. S. Face has David and Solomon holding a child or other up-side down and St Paul or maybe St Anthony in the Desert. St Patrick’s (Church of Ireland) church at Donaghmore is a 19th century building that replaced earlier Medieval churches and, before those, a church that was founded by St Patrick, patron saint of Ireland, in the 5th century. St Mac Erc, who was the brother of St Mochaoi (Mochua) and a disciple of St Patrick, probably became the first bishop of Donaghmore. His feast day is celebrated on 6th July. St Mochaoi founded the monastery of Nendrum on Mahee Island, Co. Down. He died in c497. Legend says that St Patrick converted the local chieftain to Christianity here at Donaghmore, and in thanks ‘he’ built his church beside the fort (rath) from where the chieftain ruled his people. There is a blocked-up souterrain (underground passage) in the churchyard; this may have originally been connected to the fort. The church itself stands on the mound which was part of the fort. There are also some faint earthworks in a field on the opposite side of the road over to the west of the churchyard at (J 1012 3496). Connolly, Greenwood, Hawkins & Wallis, Ireland – The Rough Guide, Rough Guides Ltd., London, 1999. Fisher, Graham & Pennington, John, Historic Britain, Odhams Books, Feltham, Middlesex, 1953. Categories: Ancient Crosses | Tags: Donaghmore High Cross in County Down in Northern Ireland | Permalink.